In the summer of 2016, British explorers Olly Hicks and George Bullard set out to attempt the world’s first documented crossing from Greenland to Scotland by kayak. The expedition covered over 1,200 miles at sea, taking the pair over 8 weeks to complete having left the UK. Olly and George arrived at Balnakeil Bay, Cape Wrath, in Scotland having undertaken a hazardous journey from the shores of Eastern Greenland to the northern Scottish Isles. After three days of crossing the Denmark Strait to Iceland, the duo hopped along the Icelandic coast, sleeping on land at night to allow them to fully rest up before taking on the six-day crossing to the Faroe Islands across the formidable stretch of ocean known as “the devil’s dancefloor”. Having left Iceland for their first attempt to reach the Faroes, crossing this notorious stretch of untamed ocean, Hicks and Bullard turned back after 48 hours at sea on this leg, as conditions became too rough and they were unlikely to make landfall safely and in time before the weather deteriorated further. Their grit and resolve with turning back, knowing that they would have to leave again to attempt the same stretch, proved worthwhile and the weather gods granted them safe passage on their second attempt. “The devil let us across in peace on the second attempt – without us having to dance too much! 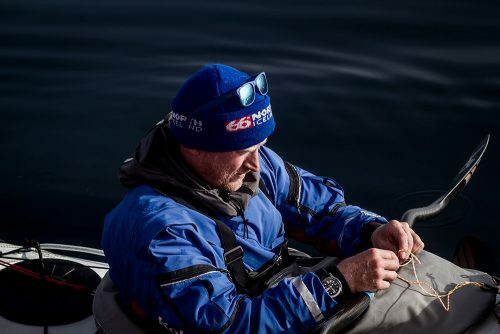 Fingers crossed we’re allowed to cross to Scotland similarly unscathed but we will of course be pulling out all the stops to make our own luck too” said veteran ocean rower Olly Hicks. The Greenland to Scotland Challenge was the first modern day voyage of its kind to complete this route, and Victoria was pleased to be a part of the planning team and managed the emergency and safety back up while Olly and George were on the water. Victoria was in charge of all crisis communications and was delighted when the team reached Scotland unscathed. Having worked for Olly in 2011/2012, Chase is honoured to be able to continue this association. I am not afraid of storms for I am learning to sail my ship. © 2019 Chase Expeditions. All Rights Reserved.